In 1984, when Columbia Pictures announced that John Carpenter would be directing its big-budget Christmas release 'Starman,' more than a few eyebrows were raised. What would Carpenter, master of the dark macabre of 'Halloween' and the ultra-nihilism of 'Escape from New York' and 'The Thing,' make of this gentle, sentimental sci-fi romance? It at first appeared to be a mismatch of sensibilities, and though 'Starman' would only earn pleasing critical notices and respectable box office, time has been particularly kind to the film, and proven that Carpenter always had more up his sleeve than just shocks and scares. 'Starman' remains one of his most underrated and overlooked pictures, a little gem that ranks as a true sleeper of the decade. Often unfairly dismissed as "'E.T.' for adults," the script for 'Starman' was actually conceived years before the Steven Spielberg blockbuster, though the films do share some story similarities. Jeff Bridges (who earned a Best Actor Oscar nom for his efforts) stars in the titular role, as an alien life force sent to Earth following receipt of the Voyager moon landing transmissions. Suffering a crash landing, he must assume the identity of a local deceased Wisconsin house painter. Waking up to find a very strange visitor in her living room, widow Jenny Hayden (Karen Allen) and the Starman embark on a cross-country trek. Though Jenny is at first a reluctant hostage to her alien abductor (especially since he looks but does not act like a Stepford version of her dead husband), soon they will bond and grow to love each other, as the government and military (led by SETI agent Charles Martin Smith) close in. 'Starman' really isn't a science fiction film. Aside from an early sequence of alien transformation and a couple of scenes with now-quaint action and special effects, 'Starman' is a love story staged as a road movie. It's a concept always teetering on the edge of schmaltz, but Bridges is so adept at turning the Starman into a wholly-unique and innocent creation that we completely accept even the most sentimental aspects of his journey. The emotional build of of the story is also astutely plotted, so as the Starman comes to better understand human culture (via some admittedly cutesy encounters with the hostile locals), so, too, does Jenny begin to finally learn to heal her broken heart. It's this intertwining of the fate of two characters that is 'Starman's greatest joy, and what makes it rather unique in the sci-fi genre. Bridges certainly earned his Oscar nod. His body movements, vocal mannerisms, and ability to convey a growing intelligence are all extraordinary. But Allen's role may actually be trickier, for she must not only play "straight man" to a gawky alien, but express Jenny's quiet turmoil without lapsing into Hallmark Card treacle. She's the real emotional heart of the film, and some of the best passages involve simple conversations between Jenny and the Starman, where the full extent of her loss is revealed (Allen's face is wonderfully expressive). She and Bridges generate a real chemistry and heat here, too, so by the time they finally consummate their relationship, scenes that on paper read as truly bizarre (and even camp) transcend any limitations and earn every single one of their emotions. Though 'Starman' will likely, if unfairly, never earn a place in the top ranks of the Carpenter oeuvre, it's an illuminating peek into a side of his sensibilities that he's never shown in a film before (or since). He resists a heavy hand, favoring intimate close-ups that let the actors shine, admirably pulling back on the special effects and gimmicks to simply let the story tell itself. He also shows fine flair for picturesque American vistas, and as always, makes full use of his widescreen Panavision frame. Carpenter has often been accused of being laconic, or pessimistic, but his fine work on 'Starman' proves the old adage that inside every cynic beats the heart of a failed romantic. 'Starman' may not, perhaps, be a true classic or even Carpenter's absolutely best film, but it shows more of the man than any movie he's ever made. 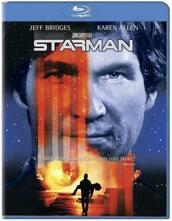 Sony presents 'Starman' in a 1080p/AVC MPEG-4 transfer, framed at 2.39:1. Sony has been archiving its films for many years in HD, and 'Starman' was one of the earlier ones. It looks OK, but the film itself doesn't not really lend itself to sparkling high-def. The film is awash in natural film grain, a color palette that's flush with warm reds and browns, and optical special effects that are tarnished with a bit of dirt and noise. The print is still generally clean, with no major blemishes. There is no great depth to the image, and blacks are somewhat weak at times. Colors never truly pop, but the film again is intended to look naturalistic. Don't expect a razor-sharp presentation or tremendous detail -- this looks like a 1984 catalog release. Still, 'Starman' has never looked better, so for what it is, this is a pretty good transfer. The highlight of this first-ever 'Starman' Blu-ray is its Dolby TrueHD 5.1 Surround track (48kHz/24-bit). The previous DVD suffered from a 2.0-only mix, even though the film was originally a Dolby six-track theatrical presentation. 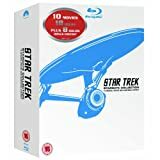 This Blu-ray finally rights that wrong. 'Starman' still sounds limited compared to today's uber-roof-shaking blockbuster soundtracks, but it certainly feels more open and impressive in TrueHD. The rears finally come alive, with nice uses of ambient sounds and atmosphere. Take the scene where Jeff Bridges, newly inhabiting his human body, hears helicopters fly-over the house of Jenny Hayden. The subtle use of discretes here informs a new understanding for his character, and is a good example of how important sound can be to the meaning of a film. Discrete effects remain sporadic throughout the rest of the film, usually for action moments, but 'Starman' is in general a subdued sci-fi story. Low bass is also improved, with some real heft and depth (the soundtrack is a welcome beneficiary here). Dialogue sounds fine, though it doesn't stand out in any perceptible way. Unlike the video, which rates as more-or-less average, the audio here is a nice upgrade. Sigh. I've been waiting for Sony to release 'Starman' on Blu-ray (or re-issue it on DVD) with all of the bonus features found on the Region 2 version. 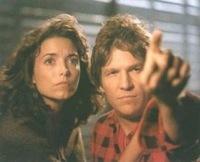 These included an audio commentary with John Carpenter and Jeff Bridges, deleted scenes, and a music video. Alas, Sony has simply not bothered -- a real letdown, and a huge disincentive for diehard fans to purchase this Blu-ray. Theatrical Trailer (HD) - Woo-hoo! We do get a full-screen trailer in poor-quality video. 'Starman' is a sweet and poignant sci-fi love story. It's effects may be dated, but its human emotions are not -- it's a real sleeper. Unfortunately, Sony seems to have just tossed this one off on Blu-ray. The video and audio are fine, if no great shakes, and none of the Region 2 DVD special features have been included. As much as I would love to wholeheartedly recommend this one for fans, it's a depressing missed-opportunity.